DynSite is an advanced automatic IP updater application that takes place in the notification area. 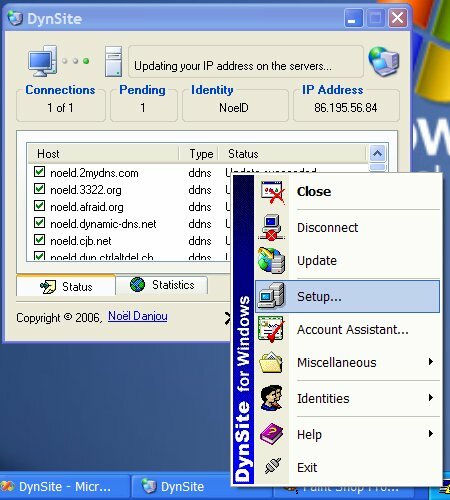 DynSite monitors the IP address of your Internet connection and updates your dynamic host or domain name(s) accordingly when a change is detected. This makes it as easy to anyone to connect to a server running on your own computer (Web, FTP, Forums, Games, etc.) as connecting to any other sites on the Web. All you have to do is to sign up with one of the supported dynamic DNS services and to run DynSite. DynSite provides many features and supports many kind of configurations. Click Help > Contents... from the context menu of the DynSite icon to access the included help file. If you need further assistance, information or tips, please check the Frequently Asked Questions.